This cereal began as a diet food. A few years back my husband knew he needed to lose weight before his hip surgery. His doctor recommended that he eat 2/3 cup uncooked oatmeal for breakfast, moistened with orange juice. His doctor was a vegetarian, and he thought this would be healthy. My thought was that healthy or not, I could not conceive of eating uncooked oats -- especially not topped with orange juice. But my husband grew to enjoy it, so one day I got brave and decided to add a few uncooked oats to another cereal I normally had for breakfast, topped with nonfat milk. It was pretty good. Then I got really brave and started experimenting with combining two or more boxed cereals. It guess it was the success of those experiments that made me decide to just try combining the oats with other things. 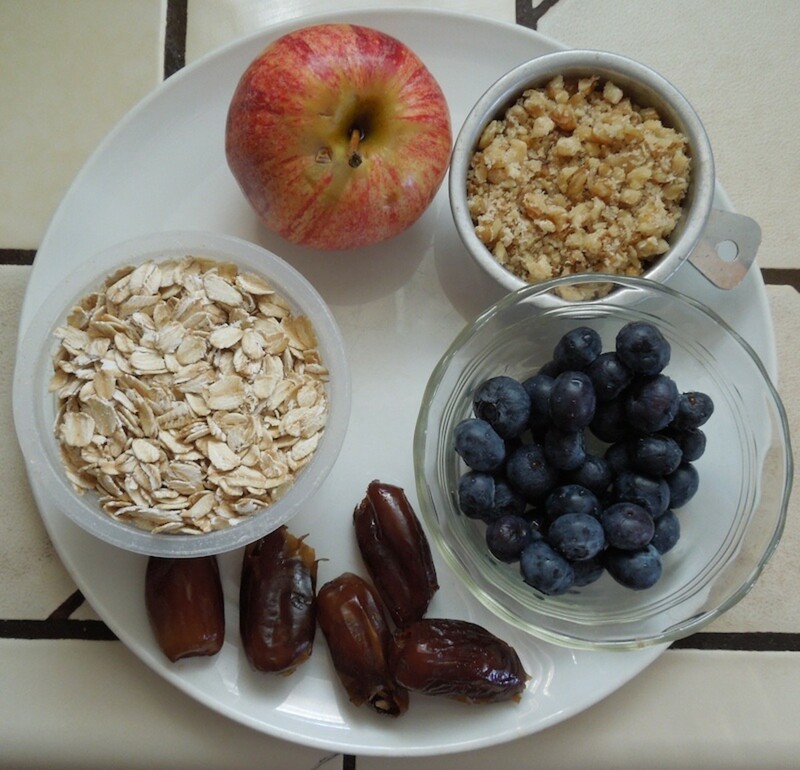 My first attempt was to measure out the oats into the bowl and then add some dates and chopped walnuts. I topped it with skim milk. It was delicious. My husband tried it that way, too, but thought it was a bit fattening, so he went back to oats and orange juice, except when he craved a change, but I noticed he was swiping a few dates after breakfast almost daily. I went on a whole wheat toast and peanut butter binge about that same time since it was winter. Meanwhile, his friend started extolling the virtues of buckwheat and gluten free eating. i bought some buckwheat cereal that needed to be cooked and made it into a breakfast pudding for him, and he got hooked on it. Unfortunately, I didn't enjoy it as much as he did, and when the weather got warmer I didn't want a hot breakfast. So I started experimenting with the oats again, this time adding chopped apples and blueberries, since I wanted more fiber and the phytonutrients in the fruits. When Kosta saw me eating this, he decided to try it, too, and now there are many mornings when he eats it with me. It's not especially low calorie, which is why I call it a power breakfast. It has enough calories, protein, and fiber to keep me from getting hungry for hours. All the sugars are from the fruit itself. This is perfect for those who need to eat more fiber and for those who want all their calories to be nutrient intensive. When I prepare this, I prepare it for two people at once in two cereal bowls, so the ingredient amounts given are for two people. As I prepare each ingredient, half of each goes into the proper bowl. 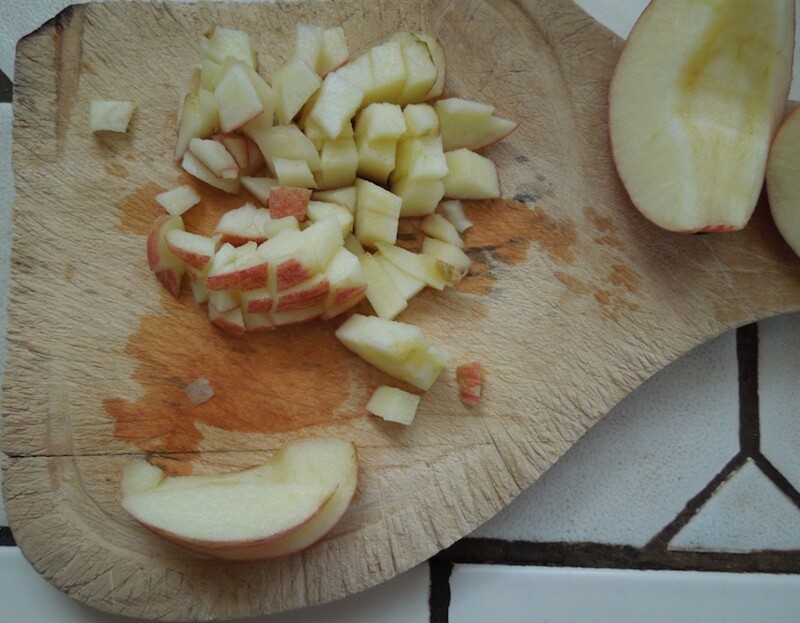 I split the apple first and put half the chopped apple into each bowl. Then I distribute the other ingredients. Until I started to write this, I never thought about measuring anything. My husband keeps one of those individual applesauce containers as a measuring cup in the oatmeal container, and we always used one measure each. That works out to 2/3 cup. If you don't want to eat quite that much, you can easily move it down to 1/2 cup per person. If blueberries are not in season or are two expensive, you might want to substitute raisins. 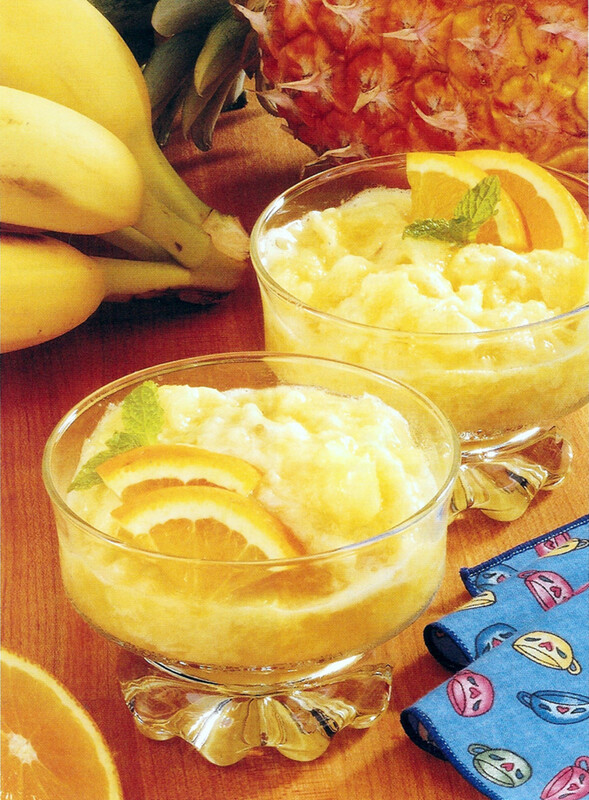 Experiment with other fruits you like. Strawberries might be good when in season and could substitute for either apples or blueberries, but I probably wouldn't put the dates in with them. This recipe is a guideline, and don't feel bound to stick to the measurements. Most of the calories are in the oats and walnuts, also the primary protein sources. I'd keep those as a base and then add any fruits you think would taste good together. I top mine with goat's milk, and Hubby still uses orange juice. What takes the time is cutting the fruit. If your mornings are rushed, you could make this the night before and refrigerate until morning. 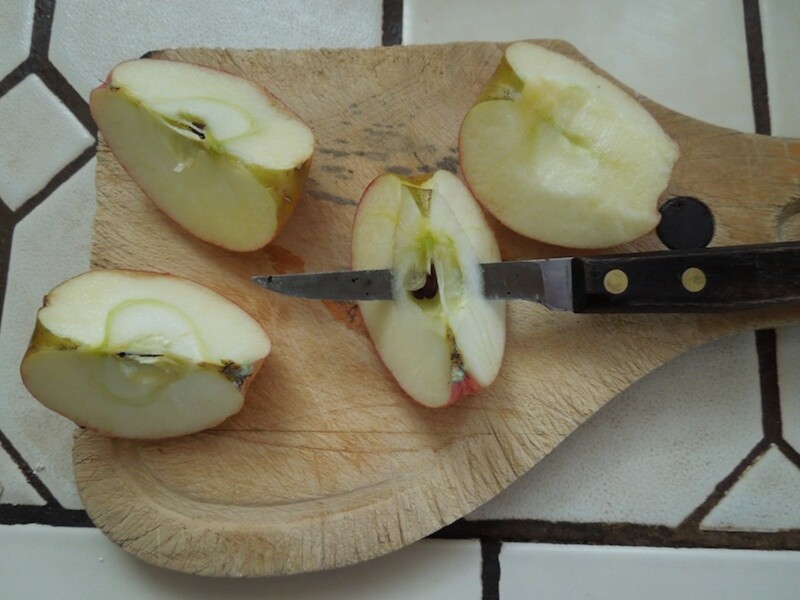 If you live by yourself, you can eat half the apple before preparing the other ingredients and halve the amounts. On the mornings Kosta eats something else, I give him the other half apple. No one serious about cooking should be without a pair of kitchen shears. They are not only great for cutting up the dates in this recipe, but I also use them to trim the sometimes unattractive edges of romaine lettuce and to trim the fat and gristle from chicken breasts and meats. These do jobs it's much more difficult to do with a knife. Lay out two large soup bowls of about 10-12 ounces. Chop the shelled walnuts in a nut grinder or cut them up in small pieces with a knife. Put half in each bowl. Wash, core and chop the apple into small pieces, as in picture. 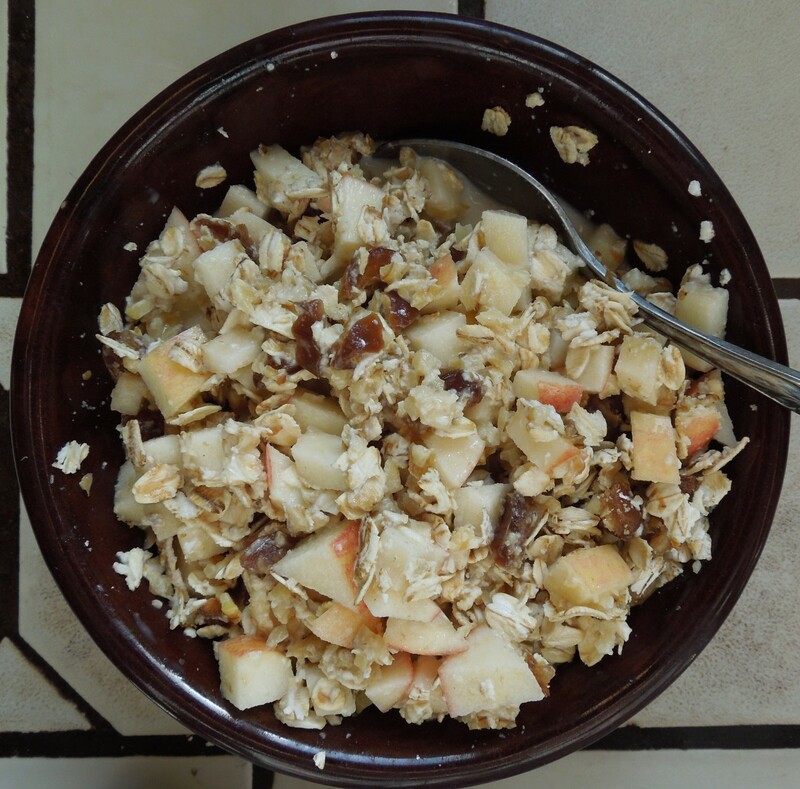 Put half of the chopped apple in each bowl. Rinse blueberries and set aside. Put half in each bowl. Measure 1/2 to 2/3 cup oats into each bowl. Nutrition index is for using 2/3 cup each. 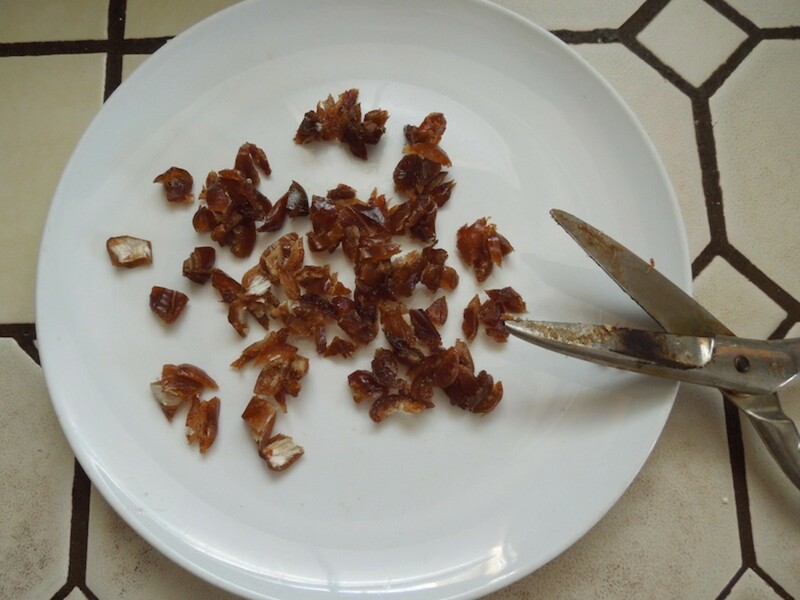 With kitchen shears, cut three of the six dates right into each bowl. Mix the ingredients together. Pour milk or orange juice over them to taste. Enjoy. If you are a bit prejudiced against eating uncooked oats, think of this as unbaked granola without the extra sugar and processed fats you find in such products. I did a comparison with my favorite granola, which happens to be Quaker 100% Natural Granola Oats, Honey and Raisins. One cup of my power breakfast does have over twice the fat of a cup of the Quaker cereal because of the nuts, but only 1/2 of the saturated fat. Neither has any trans fats. My cereal also has 2 grams more fiber and 2 grams more protein. MIne has two more grams sugar, but none of it is refined. Quaker has brown sugar and honey in addition to the sugar in the raisins . A cup of my cereal has 350 calories compared to 412 of a cup of the Quaker cereal. My ingredients also have less processing and do not include whey, inulin, glycerin, whey protein concentrate, and other more processed ingredients. I think I get a more powerful nutrient punch calorie for calorie. And if I eat breakfast at nine I don't get hungry again until two or three, so I don't need to snack on junk food because my stomach is growling. Keep in mind the recommendation that breakfast be the biggest meal of the day, and you'll see why I have this often. It's healthy and it's hearty. The beauty of it is that you can add whatever you like. I don't like chocolate until after lunch, but I add whatever fruit or nuts I happen to have on hand. Sounds delicious! I love inventing combinations like this. If I were eating it, I'd add a few dark chocolate chips, which I have every morning with dry cheerios and Craisins. Perhaps I'll start adding oats to my bowl, too. We eat this at least three days a week, and even more in summer. When we can't get fresh blueberries at a reasonable price, we use frozen ones and just rinse off what we need to partially thaw them. By the time I add the other ingredients, they are completely thawed. This cereal sounds wonderful and I can see why it would be filling. I have never even thought about having uncooked oats but it doesn't sound bad at all. I know that I should eat breakfast,but I never do. I feel like that is the reason why I just keep holding on to this extra weight. This hub is a great motivator. Thank you! I used to make the hot oatmeal with chopped apple, walnuts, and cinnamon, but my husband now seems to prefer my buckwheat blueberry puddling instead now that I invented it, and he even wants it sometimes when it's hot if he has a long day ahead out of town and needs a really strong breakfast with the added egg protein. I make about six serving of that, put it in the frig, and he can have it whenever he wants the hot breakfast. I stick to my power breakfast. WannaB - Great suggestions. I do like cooked hot oatmeal and I have put chopped apple and walnuts in it. But that only works for me in cool or cold weather. Now that its hot, I want something cool, so I am going to try your Power Breakfast Cereal. Thanks. :) Sharing. Always exploring, I fully understand where you're coming from. 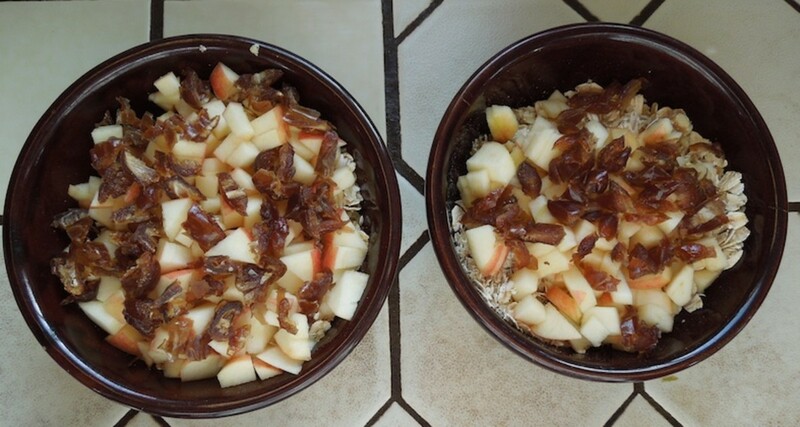 It took me over a year to try it, and after I did, I discovered the uncooked oats were fine. This cereal just needs to be topped with a liquid like milk or juice. To tell the truth, I've never liked the texture of cooked oatmeal, and uncooked oats don't have that weird texture. Do you like oatmeal cookies? I realize they are baked, but still pretty dry. The thought of eating uncooked oats turned me off, but i see that adding them to other cereals might not be too bad. I like your list of breakfast foods. I am an avid believer in nuts and fruits. Thank you for sharing..
Good point about portion size! SweetiePie, thanks for pointing this out to those who are terrified at the thought of extra calories. When I calculated nutritional value, I used the size portion I actually eat. When I compared it to the other cereal, I used the same portion size -- one cup. Many people look at the calorie count per serving, but actually eat much more than the serving size on the box, which for the Quaker granola was only half a cup. I know very few people who actually only use half a cup of any cereal. Half a cup fits into a custard cup, and most people use at least a small bowl and have at least 2/3 a cup . So calorie counts on boxes often don't tell the whole story. 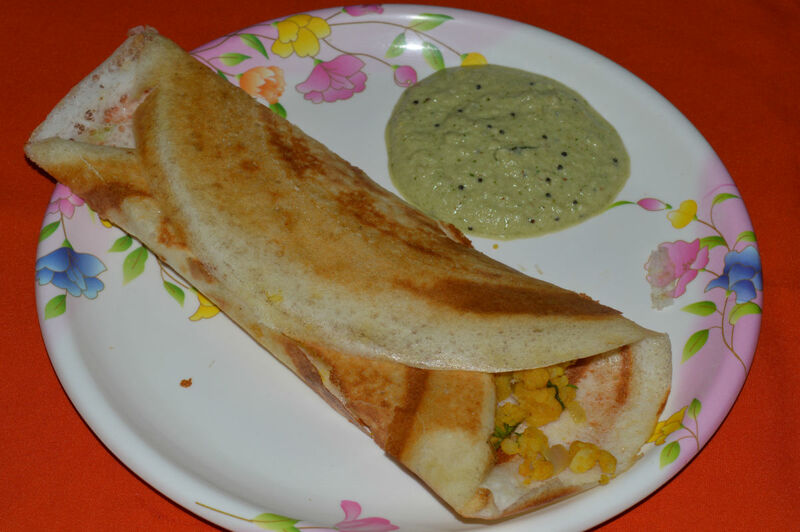 I had it for breakfast again today. We were out of blueberries, so we used strawberries. I like it better with blueberries, but strawberries also work. You might consider orange juice, as well as water. My husband says it's very good. I've never tried nut milk. Thanks for stopping by. A high calorie healthy meal is better than a low calorie junk food breakfast. People can always go for a walk or run during the day if they feel like they consumed too many calories. I love to eat a wide range of healthy foods, and my appetite is hardy. I would rather exercise and enjoy meals rather than be a calorie counter, which I am not :). Your breakfast cereal looks good to me! This looks yummy to me. I do not like dairy so I will use nut milk or water. Since I really am not a breakfast person, I usually have to make myself eat. I can do this though as it is light and cold. 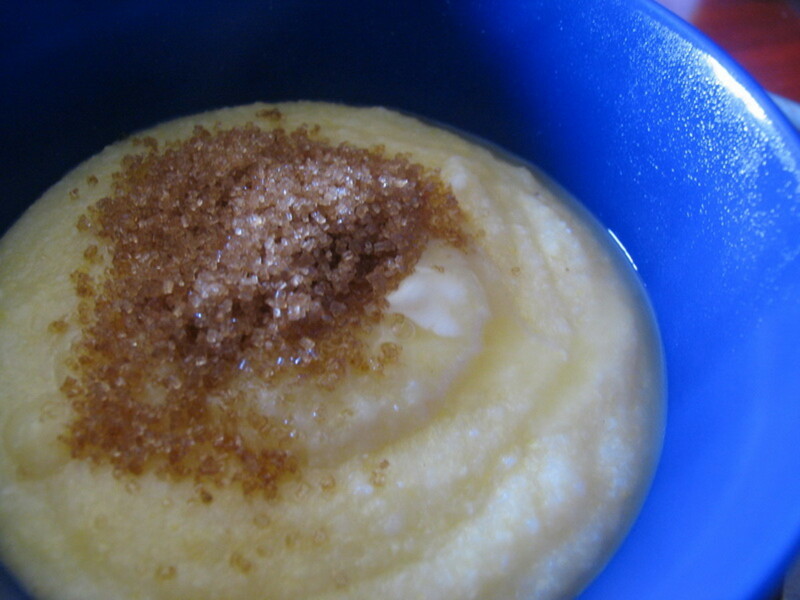 Thanks for this great and healthy recipe!